Kick off your dream job as an apprentice! Connor has been accepted onto the Welsh Rugby Union’s Coach Core apprenticeship programme after receiving careers help and guidance from Careers Wales. Connor Prankerd, a former pupil at Bedwas High School, wanted to be a sports coach from a young age. 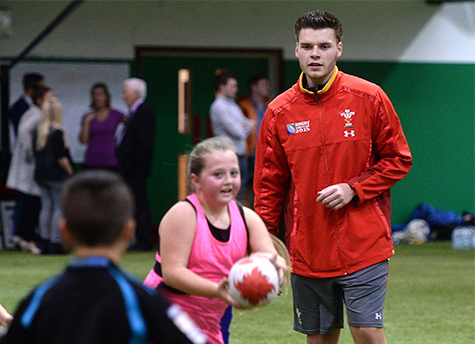 After studying sport for three years at Ystrad Mynach College, Connor flew out to America to coach young children at Challenge Sport summer camps in locations across the country. “When I got home from America I was keen to start looking for a job that had links with sports and coaching, as that’s what I’ve wanted to do for a long time and it’s what I’ve been studying for and working towards”, said Connor. “My dad told me about Careers Wales and that they would give me advice on what to do next, so I went to talk to one of the advisers. I told them I was interested in sport and wanted to coach. They were happy to help and searched for jobs with me, and found the WRU coaching apprenticeship, which sounded amazing. Connor was then invited to an interview at the Millennium Stadium, and attended a five day coaching trial before being told that he was successful. Connor continued: “I’ve only just started the programme, and it’s going to be a tough year with a lot of work involved, but I’m really excited to get stuck in and do something I’m passionate about. “I’m so grateful to everyone at Careers Wales who helped me get to this point – especially Hayley – I keep her updated on my progress and couldn’t wait to tell her that I had won a place on the programme.